Located at the quite corner of Tran Hung Dao & Le Thanh Ton street, 100 metres from the beach, Vien Dong hotel is an ideal address of visitors. The hotel offers 173 guest rooms and suites designed and furnished with modern amenities, 2 restaurants, conference rooms, outdoor swimming pools, commodious and airy garden. 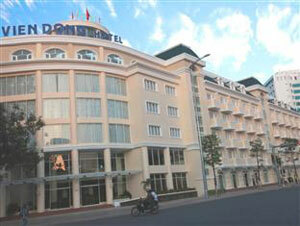 The hotel also attacts tourist by enthusiastic, friendly and professional service of hotel staffs. Free use wireless internet access. Offering a large menu of Western and Asian, a variety of seafood and Vietnamese specialities. Location : by the pool side.